I’m back at it with the blogging help posts. Today I’m teaching you all about Klout. Klout is the social media ranking tool you didn’t know you needed - it will help you forge brand partnerships, improve engagement and share original content. 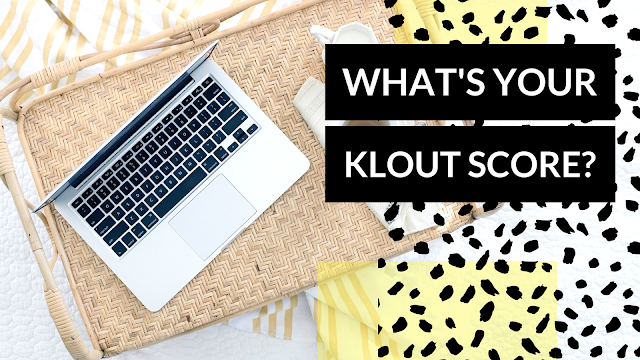 I first stumbled upon Klout back in my early blogging days but didn’t realise just how influential your Klout score could be until I was asked by a trustee at my organisation to keep a record and report month-on-month. Since then I’ve moved jobs but still rank Klout as one of my most-used social media tools, especially when it comes to influencer outreach. Why is this you ask? Using over 400 different social media factors, Klout’s algorithm ranks individuals between 1 and 100. A that represents your influence across your social channels such as Facebook, Twitter, LinkedIn, Instagram and Pinterest. You can read more about your Klout score here. Your Klout score is a fantastic piece of information to include in your media kit to show how engaged you are on your social channels. It shows that you’re social media savvy and you know what you're talking about when it comes social, which is handy for sponsored posting. You can build relationships with other bloggers who have a genuine passion, interest and following. As a business, I’d be more inclined to get in touch with a microinfluencer with a high Klout score and a slightly smaller following than a bigger blogger, as it shows they’re passionate about their niche and engage with their following. As a social media manager, you can sometimes get a lot of tweets and simply can’t give each one the love and attention it deserves. Your Klout score shows me at a glance how beneficial it would be to engage with you so the higher it is, the more likely I am to strike up a conversation. The best part is that, with the Klout Chrome extension, also available for Firefox, you can view other Twitter users’ Klout score right there in your timeline. You don’t have to search for it manually. Though, if you’re like me and have a keen eye for social stats, you can always check up on how your Klout score has progressed over the past 30 days using their Measure tool and the influence each social platform contributes to it.